In each release of HEEDS, new capabilities are added to simplify capturing and automating process workflows as well as exploring the design space for more innovative solutions and ways of visualizing results to gain deeper insight into product operation and performance. Comparing design exploration results between different projects, models, or to experimental data is a valuable way of gaining insight. This is often used for evaluating performance against legacy designs or even competitive products. Results comparison is now even easier to undertake in version 2016.10. Results from any external source can now be imported directly into HEEDS Post. We will use an industrial exhaust duct example in Figure 1. to highlight how this works. The challenge for this duct system was to improve the uniformity of the flow at the outlet where a filter is used to trap particulate matter. The installed system only achieved 60% flow uniformity at the outlet, leading to excessive filter cleaning and replacement costs. HEEDS was used to improve the uniformity by retrofitting a deflector vane in the duct, which increased flow uniformity to 93%. However, due to a concern of the temperature effects on the deflector, a second design exploration was conducted accounting for structural material limitations. 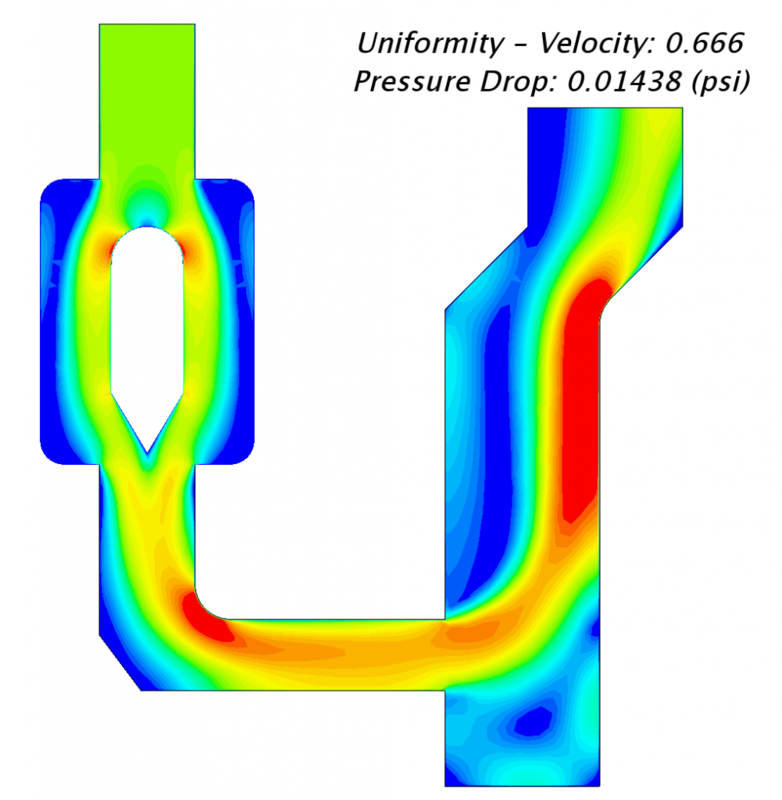 This combined design exploration study led to a final flow uniformity of 90% (see Figure 2). 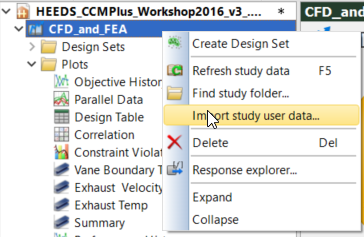 To compare the data between the CFD-only and the combined CFD/FEA design exploration in HEEDS Post, you just export the CFD-only data to a CSV file using the “Save plot data” feature. This can be done on any plot or design table from the toolbar in HEEDS Post as shown in Figure 3. This data can then be imported to any study by right clicking on the study in the project tree and selecting the “Import study user data…” option as shown below in Figure 4. Similar to the way external curve data is imported into HEEDS, user data can be mapped to the variables and responses of the given the project. 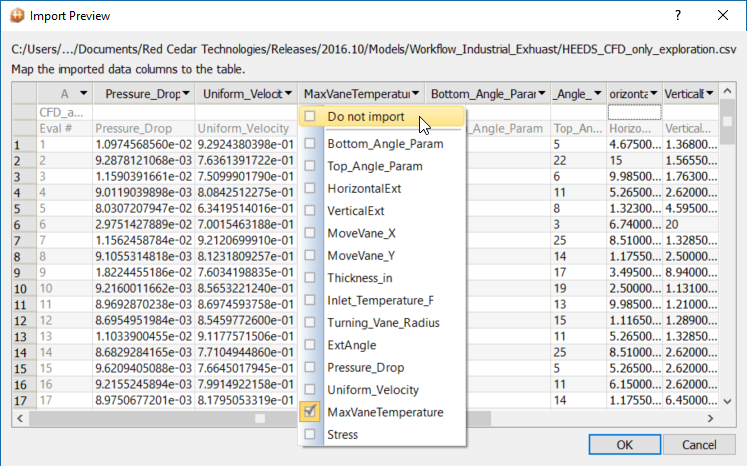 If there is a header row in the file, HEEDS will automatically map columns of data with parameters of the same name as shown below in Figure 5. 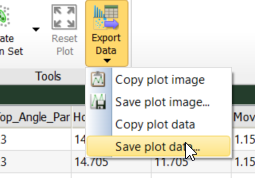 The imported data is stored in a unique Design Set so that it can be easily utilized in plots within the current study. 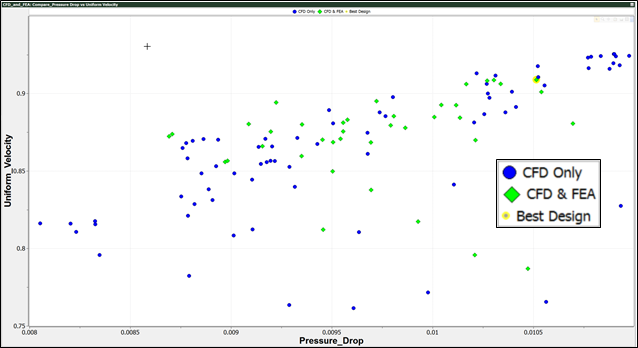 For example, the reduced number of feasible designs and the associated variable ranges can be compared in a Parallel Plot (Figure 6) or Scatter plot (Figure 7). 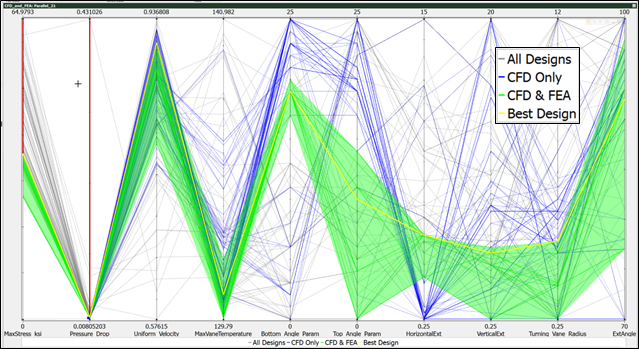 In Figure 6, we can see that the parameter ranges for Bottom_Angle_Param and HoritonalExt are quite different for the CFD-only results (Blue) and CFD & FEA results (Green). 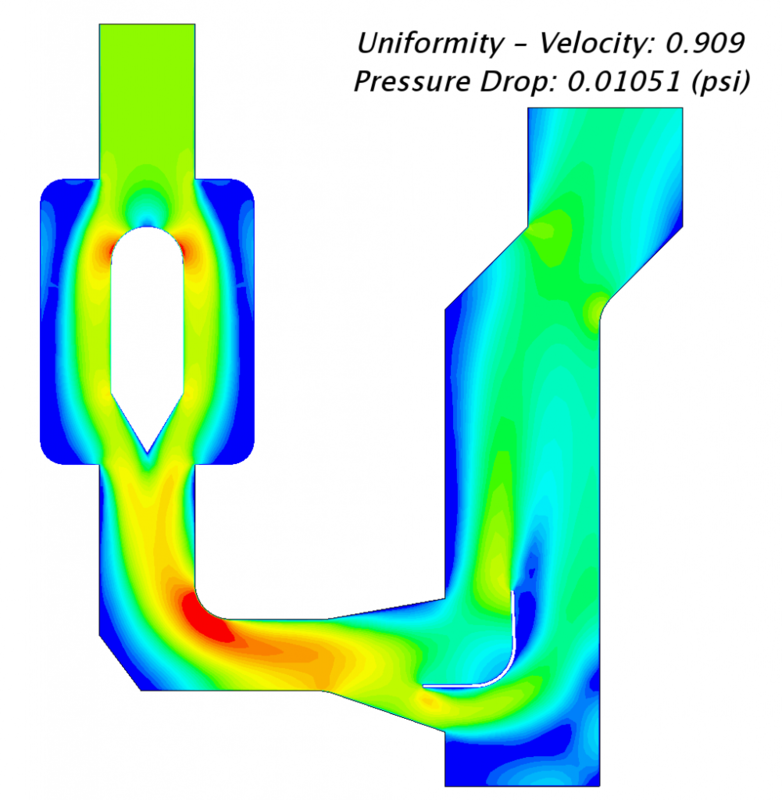 In Figure 7, the impact of maximum allowable stress on the best feasible solution is very clear. By importing and then comparing different study results, we have been able to gain further understanding and insight into how to best improve performance of the exhaust filtering and provide a robust solution that meets the physical demands of the application. This is just one of the great enhancements in HEEDS version 2016.10. To see more, sign up and attend one of the webinars this month, contact your HEEDS account representative, or contact the HEEDS support team.